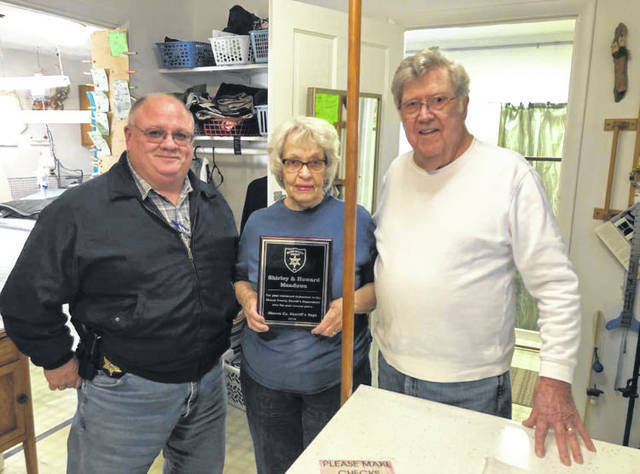 Sheriff Greg Powers pictured with Howard and Shirley Meadows after they were presented with their appreciation plaque from the Mason County Sheriff’s Department. POINT PLEASANT — A couple from Gallia County was recently honored for their services they provide to the Mason County Sheriff’s Department. Howard and Shirley Meadows, a couple in their 80’s, have had their store Shirley Meadows’ Alteration Shop for 31 years in Gallipolis, Ohio located behind Bob Evans restaurant. For many of those years, they have been providing alteration services to the Mason County Sheriff’s Department. Sheriff Greg Powers commented the Meadows’ are a very kind couple and they have helped the sheriff’s department for years, always getting their various alterations done quickly and efficiently at a more than reasonable price. Shirley shared she and Howard do alterations such as putting patches on the officers’ uniforms, hemming their pants, and letting their shirts in or out, any and all work their clothing may need. Shirley commented when Howard is working on the officers’ clothing, he takes special care to pick out the pieces that are just right to get the job done. The appreciation shown towards their work by those at the sheriff’s department, makes the couple feel good, commented Shirley. She shared the officers they work with are like their children and they are all “good boys.” They have a job where they face dangerous situations and though they have a good job and do their work well, it can be terrible at times. Along with doing personal alterations for any who are interested, Shirley and Howard also do alteration work for officers in Meigs and Gallia counties.